The updated Hyundai Veloster SR Turbo is poised to get a price cut next week to $29,990 plus on-road costs — thereby matching the Toyota 86 GT — courtesy of a new two-spec strategy. These specifications and pricing were pointed out to us ahead of next week’s official launch via a source, and are backed up by figures on a public industry database. Hyundai’s expected price reduction on the SR Turbo doesn’t come without a trade-off though. The new sub-$30K offering is a de-specced variant that loses some of the outgoing car’s luxury items. A new SR+ version slots in above and retains them. So, the regular Veloster SR with its carryover name is to be priced at $29,990 as a six-speed manual or $32,490 with a DCT. This is $3000 and $2800 cheaper than the current versions respectively. But Hyundai has removed items such as satellite navigation, electric-folding side mirrors, climate control, Flex Steer and a panoramic glass roof from this SR to facilitate the price cut. That’s where the new SR+ version rolls in. DCT incidentally denotes the new seven-speed dual-clutch automatic transmission available on turbo variants in place of the old six-speed torque-converter auto. The SR+ adds the features above — standard on the outgoing SR — and more, including heated and ventilated front seats. These versions are $1000 and $1200 pricier than the outgoing SR, which is similarly specced but lacks the DCT option, at $33,990 as a manual or $36,490 with the DCT. As part of the updates, the regular Veloster and Veloster+ variants retain carryover pricing. The base car looks set to continue as a $24,490 proposition ($26,990 with the carryover six-speed DCT) and $29,490 in Veloster+ guise ($31,990 with the DCT) that is likely to be specced the same as the faster SR+. There are no changes to the engines of either variant, with the entry Veloster continuing to produce 103kW and 166Nm from its naturally aspirated 1.6-litre four-cylinder petrol engine, and the SR Turbo extracting 150kW and 265Nm from its boosted mill. As we know, the MY2016 Veloster update brings to the SR, at least, new silver trim around its front grille, tweaked headlight graphics and foglights and fresh alloy wheel designs, while the cabin gains a perforated leather steering wheel, revised instrument cluster, and new two-tone theme with colourful highlights on the leather seats, seatbelts and centre console grab handles. There also appears to be a new matt blue paint option. There’s also expected to be what Hyundai calls an Engine Sound Equaliser, which allows drivers to modify the sound the car makes and its volume, with options such as Dynamic, Sporty and Extreme. 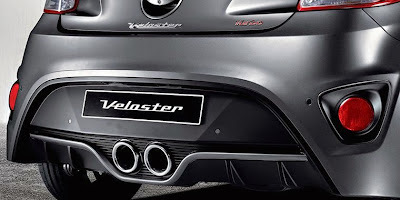 The Veloster is Australia’s top-selling ‘sports’ car this year (1158 sales versus the Toyota 86’s 1087). Expect the price strategy and publicity from next week’s update to help sales further still.